It's quite interesting that whenever we see a new Mexican restaurant open up in Vancouver, there seems to be a certain level of excitement. I guess it is mostly due to the lack of Mexican food options in Vancouver in general. Now don't get me wrong, there are many more Mexican restaurants than we had 20 years ago (when it was mostly Pepitas and Las Margaritas), but to find a good one is another issue. One of the newer spots is Fayuca located in Yaletown. 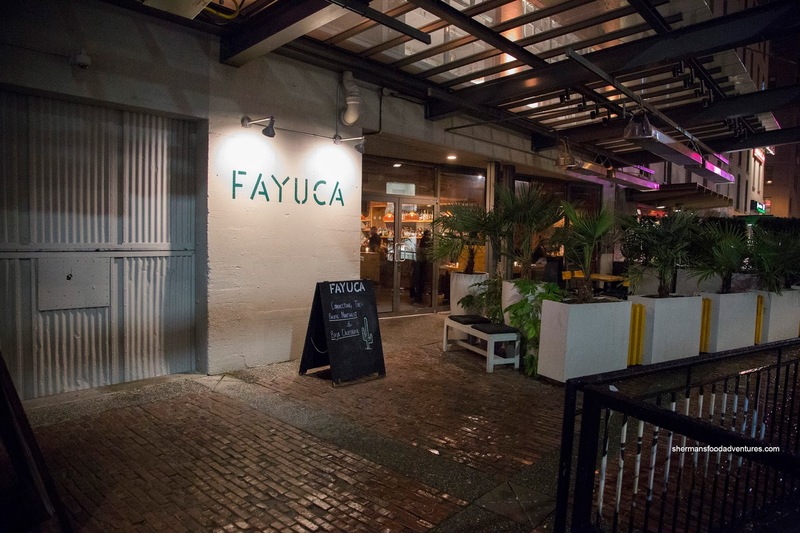 Unlike many of the more casual spots in town, Fayuca boasts more refined dishes inspired by North Pacific Mexican cuisine. We began with a few smaller plates including the seemingly simple Guacamole with crispy sunchokes, toasted pumpkin seeds and Macedonian feta. Well, it was pretty simple, but executed nicely being smooth and creamy with the crunch from the sunchokes and pumpkin seeds. 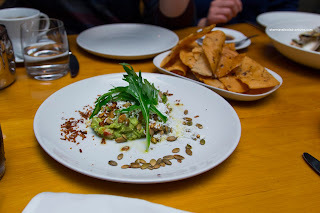 We loved the house-fried tortillas on the side as they were firmly crunchy and complimented the guacamole well. One thing we would've liked was more lime juice as there was a lack of acidity. Next up, the Enfrijolada was rather impactful from the smoked fish machaca as it was meaty, briny and of course smoky. It was encased in a thin and tender corn tortilla and smothered in an Earthy and flavourful black bean sauce. 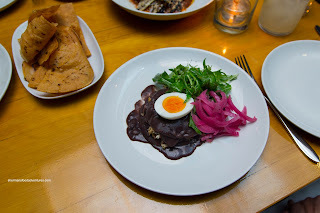 The dish was completed by pickled onions (nice acidity and crunch) and soft boiled egg. 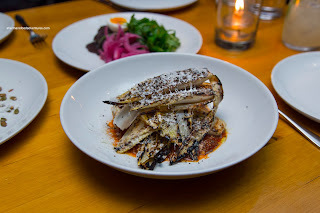 Appealingly stacked in a bowl, the Grilled Endives were nicely charred until smoky and caramelized. They still retained a bright crunch and a pleasant bitterness. Underneath, we found a mildly spicy and sweet roast red pepper puree that was complimented by the garlic anchovy butter. There was enough seasoning to be impactful while not drowning the endives in too many robust flavours. They were able to maintain the freshness and crunch of the endive. Our favourite small dish was the Oxtail Fideo Pasta with pine nut picada and aioli. 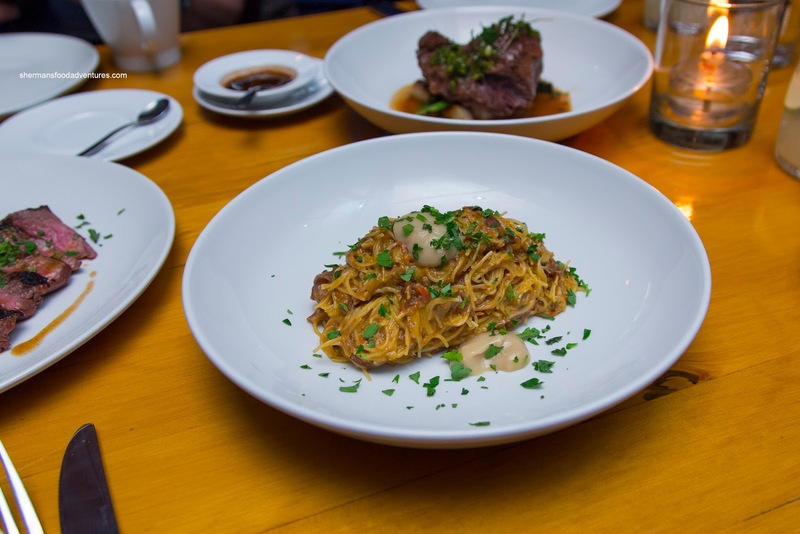 Caressed in a silky and nicely thickened sauce by the picada, the pasta was tender and flavourful. There was tang, sweetness, slight spice and plenty of savouriness. The tender and fatty pieces of oxtail added a robust umaminess. 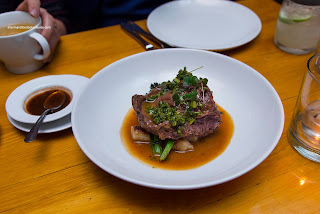 Onto some of the larger items, we had the Braised Beef Cheek with house-made gnocchi, broccolini and Mexican gremolata. When it hit the table, we were taken aback how big the beef cheek was. Definitely worth the $25.00. Even more so as it was prepared beautifully being fork tender and gelatinous. It was full of depth from the braising liquid as it penetrated throughout. Golden brown, the gnocchi were aromatic, buttery and tender with a bite. Even the broccolini was on point being crunchy and well-seasoned. 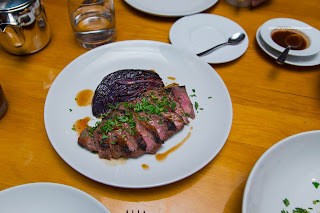 Equally delicious, the Grilled Flank Steak was prepared a perfect medium-rare. It was tender, meaty and fully seasoned. When wrapped in a tortilla, it added a chewy and aromatic essence as they were made in-house with beef tallow. On the side, we found a tender quarter of slow-roasted purple cabbage and underneath, charred leek. 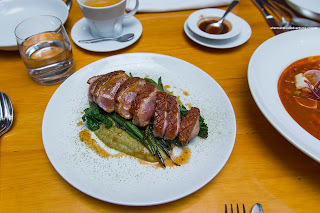 Our last 2 savoury dishes consisted of the Duck Breast and Caguamanta (Pacific Northwest Mexican Seafood Stew). As evidenced in the picture, the duck breast was very rare. For me, it wasn't a huge issue, but the rest of the table weren't big fans of it. Despite this, the duck was tender and slightly gamy with a well-rendered crispy well-seasoned skin. It rested on Brussels sprout pipian, green beans, fried kale and chili oil. The veggies were on the softer side while the pipian was mild and almost creamy. Served with the stew was a side of grilled bread, onions, cilantro and lime. 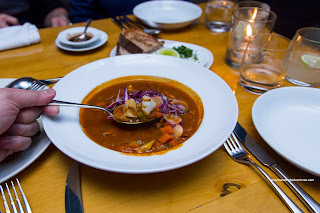 Within the stew, we found tender grilled Humboldt squid, guajillo and tomato. The stew exhibited body and spice while being aromatic with the taste of the sea. I would've liked to see more ingredients as it was more of a soup than a stew. 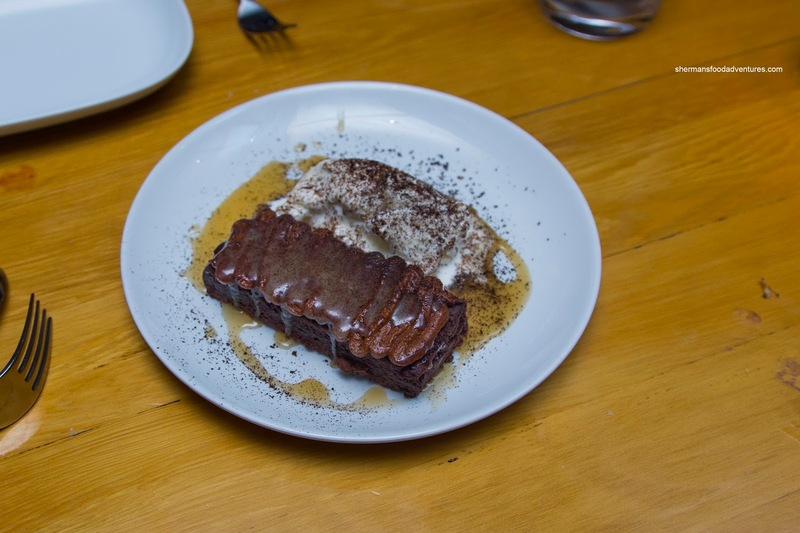 For dessert, we shared the flourless Chocolate Cake topped with light chocolate mousse and salted malt caramel. This was a rich and purposefully sweet cake that was not as dense as I expected. There was a pleasant bitterness accented by the smoky and sweet caramel. The addition of black sesame seeds on top added both texture and aroma. On the side, there was a nice yogurt crema. So normally, I would say something like the food was decent and blah-blah-blah. However, the food was far better than decent where I would gladly come back for more. Thankfully, there is a restaurant in Vancouver that serves up Mexican-inspired cuisine that doesn't involve a taco or burrito. - Nothing else to describe it other than "delicious"